This border garden extends along the east side of a 100 year old house that is part of the nurseries office complex. 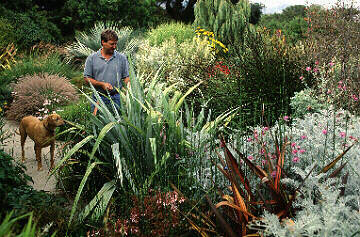 The silver plant that horticulturist Randy Baldwin is inspecting is the New Zealand silver spear (Astelia chathamica). This incredible strap leafed plant comes from the Chatham Islands of New Zealand. Looking on from his side is Tara, the Rhodesian Ridgeback whose name is commemorated by the very popular San Marcos Growers introduction Anisodontea 'Tara's Pink'. This same picture was featured in the May 1994 issue of Sunset Magazine.